Now that I live in a tiny apartment, halloween and fall decorations are less practical. There just isn’t a lot of room to store them during the rest of the year or to set them up inside the house! Having no decorations at all to reflect the season has really been bumming me out though! Enter the idea to make a few fall and halloween wreaths! Easy to make. Easy to store the rest of the year…but they still add a great punch of holiday cheer! Using inspirations from a variety of places (here, here, here, here, here, here, and here), and using these felt rosette instructions, I set to work. I decided to make a diy fall wreath (that one you’ll see tomorrow!) as well as a Halloween wreath. The great thing about DIY, is that you can do anything you want! By combining a couple of the details that I saw in images of wreaths, weighing in my own DIY skill level, and checking out what I could find at my local craft store, I came up with a general design and set to work. By changing just a few things I was able to make a Halloween wreath and then a totally different looking fall wreath too, using similar techniques and supplies. 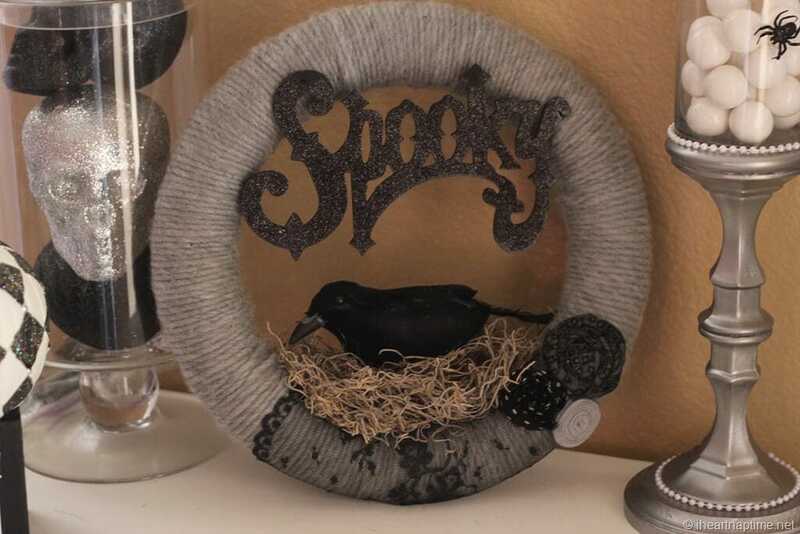 For the Halloween wreath, I purchased a foam wreath form, dark gray yarn, felt in light gray and black, an owl, and used a hot-glue gun that I already had. 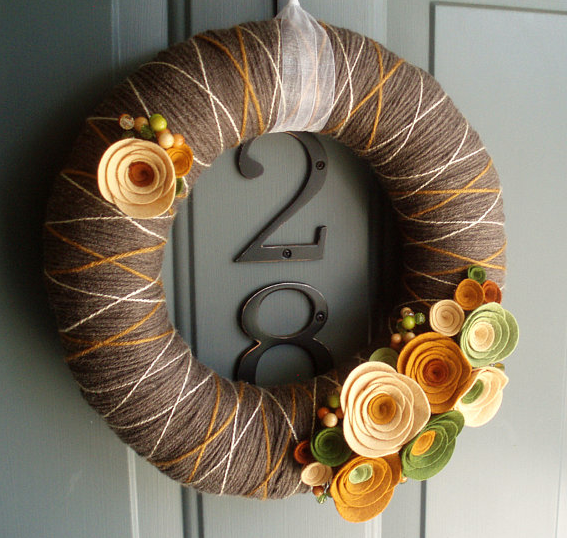 I hot-glued the end of the yarn onto the back of a foam wreath form and wrapped the yarn around the foam. Then I cut my rosette forms out of the felt. The template for making the rosettes is found here. Then I hot-glued the rosettes and the owl into place! The wreath was so easy to make. I’ve never done one before and it only took me a few hours. The majority of my time was spent wrapping yarn around the wreath form (which I did while watching Friends). The entire activity was soothing really in its repetition. Plus, the Halloween possibilities are endless. I love the monster face idea as well as the haunted house (both ideas you can see in the links at the start of this post). The raven is a spooky alternative to the owl that I used. Colors could be different. So many fun ideas! 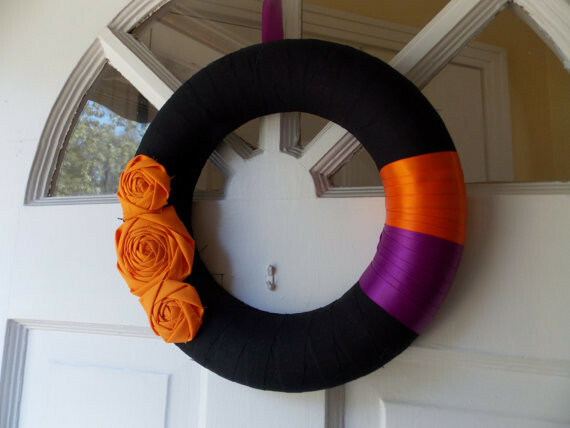 Do you have any Halloween wreaths or other crafts in mind this year?